So much for the Coalition coalescing around a strong economic message rather than constantly convulsing over its own version of culture wars on social issues. That’s so …Peter Costello-ish. The current Prime Minister certainly doesn’t seem to be interested in taking the former Treasurer’s proffered advice last week. Instead, Scott Morrison strides ever more deeply into social and cultural issues that divide and rile the country as well as the Coalition party room – even if he doesn’t always mean to. So rather than boasting about finally settling the GST dispute and passing the Trans Pacific Partnership trade deal, the government has spent more parliamentary time this week trying to extricate itself from a cultural cul-de-sac over the real meaning of it being “OK to be white”. 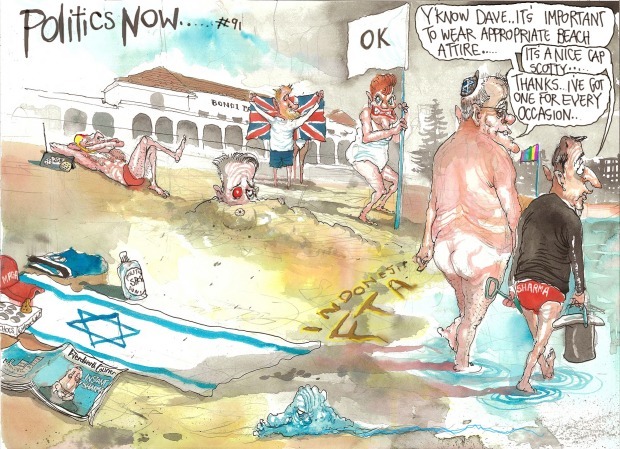 Wentworth voters may be a tad cynical as a government tries to shore up its vote in a seat with 13 per cent Jewish voters and a former ambassador to Israel as the Liberal candidate. Even if this storm in a parliamentary teacup was embarrassedly dismissed as due to “administrative error”, it only reinforces an image of a government struggling to competently manage itself. Nor does Morrison seem to have much concern about the diplomatic explosions at risk of detonating after a Prime Minister suddenly stakes out new positions on sensitive international issues. Consistency does matter – especially when a political leader is selling authenticity as his great strength. Yet Morrison and his successor as Treasurer Josh Frydenberg sound totally bemused anyone could imagine the Prime Ministerial musings on perhaps moving the Australian embassy to Jerusalem could have anything to do with the Coalition’s hot date in Wentworth on Saturday, for example. The timing, we are told, is completely coincidental and only due to Australia’s decision to oppose a United Nations vote this week on the Palestinian Authority taking over the chairmanship of the G77, a group of developing nations. Even accepting this extremely benign policy explanation, it simply fails the political pub test as far as the good burghers of Wentworth are concerned. It just looks all too convenient. Excuse them for being a tad cynical as a government desperately tries to shore up its vote in a seat with 13 per cent Jewish voters and a former ambassador to Israel as the Liberal candidate. Morrison says he is considering the issue after Dave Sharma spoke to him about the merits but that any decision would be subject to a “rigorous assessment of the potential impact of such a move on Australia’s broader national interests”. So why not quietly await that assessment? The alternative use of political loud-speaker to broadcast a possibility is absurdly ham-fisted and likely to be counter-productive with many other voters. Admittedly, Australia’s posturing on this is only a minor footnote to the constant hypocrisy on show in Middle East politics – as regularly practiced by all players with far more direct and significant stakes in the outcome. Morrison is right that the elusive dream of a “two-state solution” is in a state of permanent paralysis. Australia, he insists, is a sovereign nation with the ability to talk openly about such things. True. But let’s not pretend such talk will make any improvement to the morass of failed hopes and efforts. Nor that an Australian government thinking out loud might not produce unintended consequences with other countries, including Muslim neighbours like Indonesia, even if Donald Trump and Benjamin Netanyahu sound delighted. The White House naturally wants all the allies it can get to back some of Donald Trump’s more internationally unpopular moves – such as the shift of the US embassy to Jerusalem and also upending the Iran nuclear deal. So Morrison’s moves neatly fit the Trump framework. Not that strong doubts about the value of the Iran nuclear deal or the rationale for maintaining a dead-end status quo in the Israeli-Palestinian conflict aren’t perfectly valid. Less valid is the rationale for Australia’s latest manoeuvres looking more like transparent political self-interest – ahead of a vital byelection where the result is expected to be so close. “Australians will know this about me,” Morrison declared in parliament Wednesday. “What I believe today is what I believe next week and what I will believe a month from now. The Prime Minister didn’t quite get around to answering the other part of Labor’s question on whether he had informed Indonesian President Joko Widodo of the Australian government’s new position by text message. At least it wasn’t by a Trump-style tweet. But despite the government’s expressed confidence this will make no difference to Indonesian support for a trade agreement with Australia and its continued co-operation on a range of security issues and on the flow of boat people, this may prove an optimistic assessment. After all, the Indonesian President faces plenty of his own domestic pressures and critics ahead of an election next year. This is also a highly precarious time in the Asia-Pacific generally as the US-China struggle over trade and technology intensifies and the power balances and alliances become more unpredictable. Any Australian government would face difficulties negotiating a much more tense regional landscape after a decade of happily relying so heavily on China for boosting trade but also on the US for maintaining security and stability. This requires careful deliberate steps to protect the national interest. Instead this government seems to be more focused on distractions, deliberately created or otherwise. That really is high risk. The Bears Followed the Rams’ Blueprint, but Will They Shock the NFL?